An assimilation wetland is a natural (non-constructed) wetland into which secondarily-treated, disinfected, non-toxic municipal effluent is discharged. In the Mississippi River Delta, the wetland is typically either a freshwater forested wetland (e.g., baldcypress-water tupelo) or a freshwater emergent wetland. These wetlands have been hydrology altered, some extensively, with freshwater input reduced from historical norms. 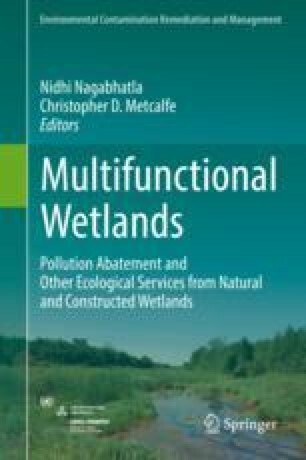 Discharge of freshwater effluent with nutrients and suspended sediments into an assimilation wetland increases vegetation productivity and accretion and combats subsidence. Effluent discharge rate into an assimilation wetland depends on wetland size and effluent nutrient concentrations. Design and construction of an assimilation wetland requires a Louisiana Department of Natural Resources (LDNR) Coastal Use Permit (CUP), a Louisiana Department of Environmental Quality (LDEQ) Louisiana Pollutant Discharge Elimination System (LPDES) permit, a US Army Corps of Engineers (USACE) 404 permit, and an LDEQ Water Quality Certification, along with potential levee board permit applications. Both a feasibility study and an ecological baseline study are conducted before discharge of treated effluent begins. Assimilation wetlands are designed with a minimum of four monitoring sites; three located along a transect from the discharge to the area where surface water leaves the wetland, and the fourth, a reference area, located in an ecologically similar wetland nearby. As part of the LDEQ LPDES permit, study sites within an assimilation wetland are monitored continually for the life of the project, including vegetation productivity and species composition, sediment accretion, hydrology, and surface water nutrient and metals concentrations. There are ten active assimilation wetlands in coastal Louisiana and another four with permit applications pending. Results of annual monitoring show nutrient concentrations of surface waters decrease with distance, reaching background levels before water leaves the wetland. While nutrient concentrations decrease, vegetative productivity is enhanced. In degraded forested wetlands being used as assimilation wetlands, baldcypress and water tupelo seedlings are often planted, which thrive in the nutrient rich environment. However, nutria are attracted to vegetation with increased nutrient concentrations, and herbivory severely damaged one emergent wetland receiving municipal effluent, killing both herbaceous vegetation and unprotected tree seedlings. After culling of nutria, the wetland recovered. This introduced species must be monitored and controlled in any assimilation wetland. Here we review the history of assimilation wetlands in the Mississippi River Delta to show how advances in scientific understanding, growing regulatory sophistication, and controversy have shaped this program. Ecological baseline studies and monitoring at the different sites were funded by the respective communities. JWD, RRL, RGH, JND acknowledge that they carried out both ecological baseline studies and routine monitoring as employees of Comite Resources Inc., which received funding from the communities with assimilation projects. A diversity of funding sources supported additional scientific studies on these wetlands, including EPA, Louisiana Dept. of Environmental Quality, and NOAA. A number of students received M.S. and Ph.D. degrees based on work carried out at these assimilation wetlands, including students from Louisiana State University, Southeastern Louisiana University, Nicholls State University, and Tulane University. Their work is listed in the literature cited. Technical Contribution No. 6573 of the Clemson University Experiment Station. WHC was supported by NIFA/USDA, under project number SC-1700424.